Elite3 and Team are pleased to inform you that we have a new listing: 346 Begonia Gardens, Oakville and the listing price is $1,049,000. Built in 2016 by Mattamy Homes, 346 Begonia Gardens is a gorgeous family home with three bedrooms and three bathrooms, additional loft in 2nd floor can be converted to 4th bedroom. The elegant French chateau-style home boasts over 2134 square feet, beautiful finishes, and a second-floor laundry. This is a unique find in one of Oakville’s newly developed neighbourhoods, close to local amenities, schools, and commuter routes. The main floor is bright and spacious, with large windows and wide engineering hardwood floors. A gas fireplace warms up the great room, and the dining room is a great space for entertaining. The open concept design leads to the kitchen, which boasts quartz countertops, glass backsplash, and a large island. Other features include a built-in pantry, bench seating, and a patio door that leads to the backyard. There is a natural gas connection at large porch in the backyard. From open to above foyer to upstairs, the open loft sitting area can be used as a family room or office. The master bedroom is sophisticated and welcoming, with a walk-in closet and a five-piece ensuite bathroom. The ensuite has double sinks, a walk-in shower, and a large tub. The second bedroom has partial cathedral ceilings and a large arched window, and the third bedroom is spacious with a double door closet. The second floor also has a four-piece bathroom and a laundry room. 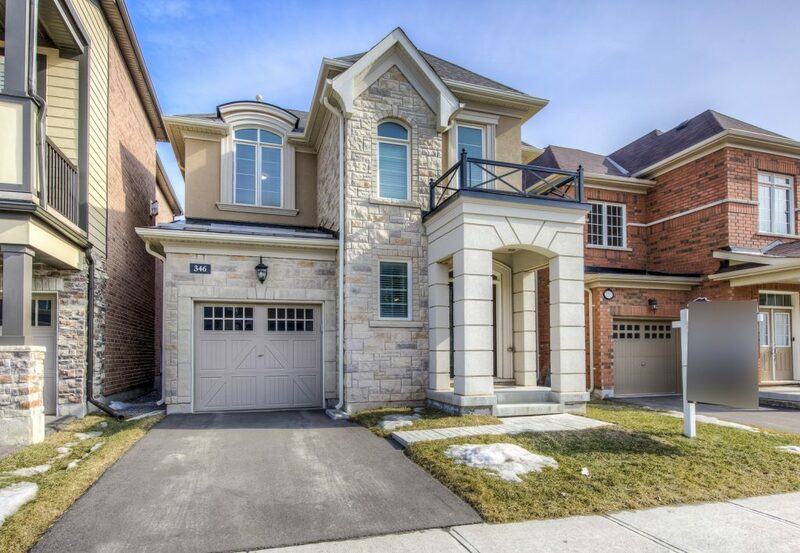 346 Begonia Gardens is located in a recently developed neighbourhood in north Oakville. This area backs onto the rural parts of Oakville, giving residents access to beautiful parks, walking trails, and green spaces. There are a number of shopping plazas, restaurants, community centres, and churches nearby, and Oakville’s uptown core and hospital are just around the corner. Nearby schools include White Oaks Secondary School, Oodenawi Public School, St. George the Great Catholic School, St Ignatius of Loyola Catholic Secondary School, and St Marguerite d’Youville Catholic Elementary School.